I've never worked in a corporate environment or in an office with strict dress codes. At my last job working with kids, comfort and being able to dash at a moment's notice were of utmost importance. In fact, I could get sent home if I wore heels or open-toe sandals. This was essentially my weekday wardrobe, and now that I work from home, it still is. On any given day, my formula includes jeans, a pretty blouse or top, flats, simple jewelry (usually a necklace and ring), and a bag that I can throw over my shoulder for convenience. I like this because although it's really easy and comfortable, I still feel put-together. Some days I'm tempted to just wear athleisure, but I feel so awkward running errands in workout clothes. Do you? I know the trend is popular but unless I truly am out and about after exercising, I prefer regular clothes. I tend to blog different looks that are more interesting because they make me feel good, but on most days, the above outfit or some variation of it is what I'm really wearing. What's your weekday style? Do you have to dress up for work? Linking up with Carylee and Rachelle today! I do dress up for work, it's a corporate office so I always make the effort to look nice. 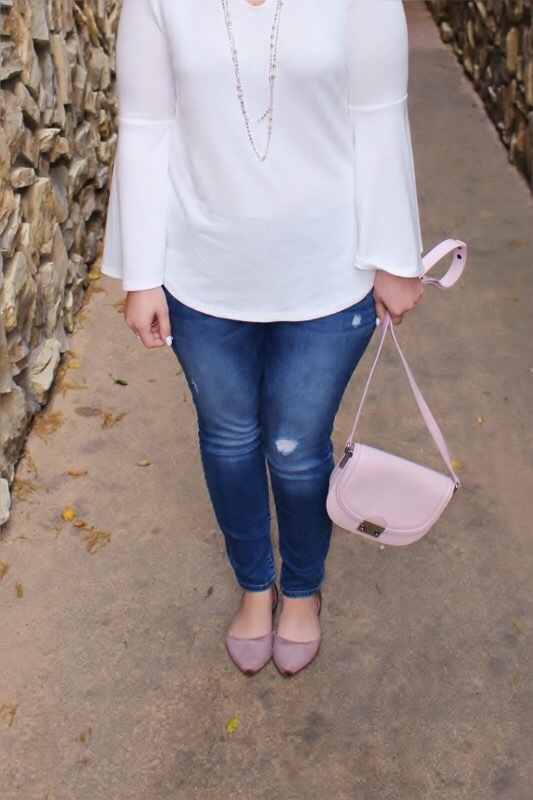 Love this weekend outfit, it is comfy yet very cute and feminine. No office job here so my weekday outfits look a lot like yours! I'm also not really comfortable going places in my workout clothes and try to avoid it when I can. Nothing against it, I just don't really feel like myself when I'm out and about like that. LOVE your new Stella & Dot necklace! 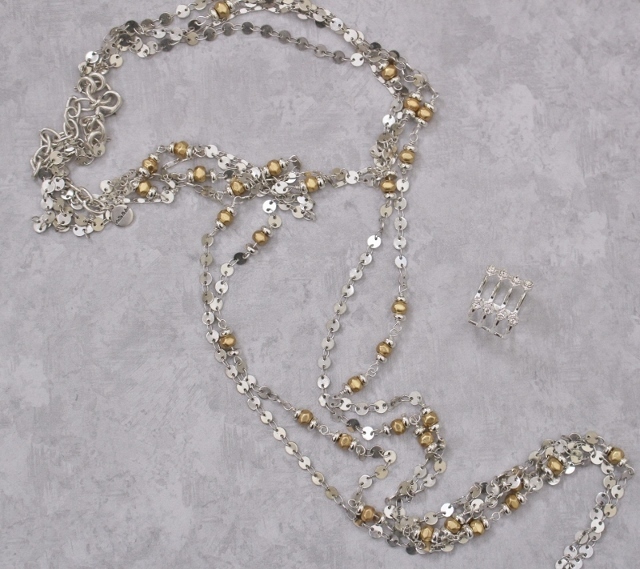 The mixed metals will go with everything!! 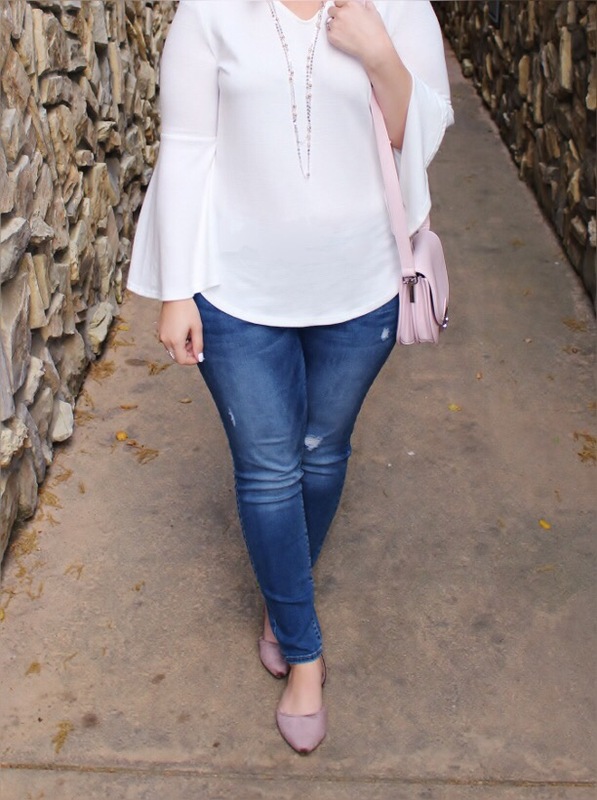 Love this bell sleeve top you have on. I'm on board with the bell sleeve trend, 8 find it much more flattering than off the shoulder or cold shoulder trends. I've played around with the athleisure look, but I agree with you, I can't be totally comfortable running around like that. I am typically all about jeans and a sweater on days I'm not at work. Love those gorgeous velvet flats! You look way more put together than I do when I am at home! My style has definitely gotten more casual since Ivy arrived. I am home more and it is just less practical to get dressed up. I wear versions of this outfit a lot. So easy and still so stylish. Love that blouse, your cute flats, and of course your pretty jewelry! I dress very casually for work - pretty much jeans everyday in the cooler months, and I'll wear my ripped ones too. Though I do like to get dressed up! I'd never run errands in my workout clothes, even if I was actually coming from the gym.